Just a month ago, we were waiting for the latest iPhone and Apple watch announcement. To mark the 25th anniversary of the first Notebook, Apple is back at it once again. This time, to focus on the new MacBook Pro. Apple was under a lot of pressure recently to create a new notebook. Not since 2013 had Apple made a transformative change to the laptop we all know and love. This caused sales to drop, and caused consumers and critics alike to question Apple’s motives. However, it seems that they had something coming all along. Miss the event? 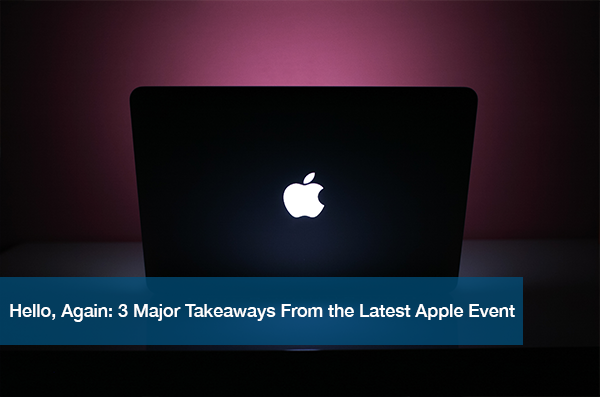 We got you covered with 3 of the major takeaways. The rumors were finally confirmed to be true. You can say goodbye to the top function keys on your keyboard and say hello to the new Touch Bar. It replaces the standard system functions to create a space that adjusts to whatever software or app you’re using. It will change the way you explore the internet, message your friends, create on Photoshop, check your email and more. Every aspect of your computer experience now changes with the Touch Bar. When you’re not using any program, the Touch Bar will serve as a control strip. This will still allow you to adjust volume, brightness, etc. Additionally, the bar provides touch ID for the first time. This makes it safer to login to your computer with just a touch. Also, change the way you shop with the new Apple Pay feature. It makes your online payments easier and more secure thanks to a new T1 chip. Siri will now be available on all of your Apple devices, making life a whole lot easier. This includes on Apple TV and the new MacBook. On Apple TV, Siri will be able to help you search through content and locate exactly what you want to watch. On the MacBook, there will be a new button on the control bar that gives instant access to Siri. There are a few important updates Apple announced regrading Apple TV. They wanted to transform the way we watch our favorite movies and shows with their new app, simply called TV. It provides consumers with a unified experience, connecting all of your viewing apps together. This way, all of your app queues can be found in one place. Also, Twitter is working with Apple today to provide an enhanced live TV viewing experience. Now, when you’re watching the latest game, you have the option to monitor your twitter feed and engage in online conversations. The new MacBook comes with many other updates as well. It’s lighter and thinner than any of the other MacBooks created. It’s also made of aluminum and metal, giving it a new look offered in both silver and space grey.There’s faster memory and storage that makes everything even faster. They added advanced thermal architecture to the fans to give you a quieter experience. There’s an all new speaker design, that offers 2 times the dynamic range of audio. You can begin ordering the new MacBooks right away.